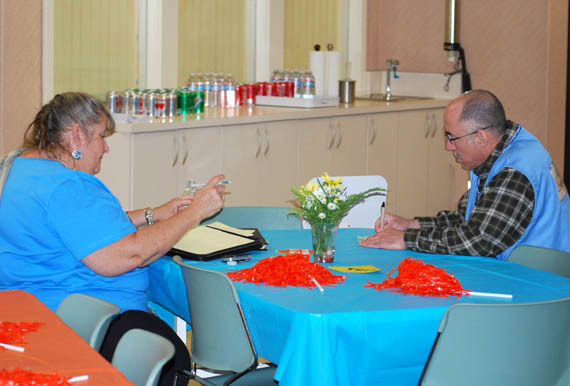 Cane Quest is a new contest being pioneered by the Braille Institute of Orange County. Visually-impaired Junior and Senior High School students competed for prizes by demonstrating their skills at navigating out in public with just their white canes. The goal is to encourage these persons to get out of their homes and participate in society. 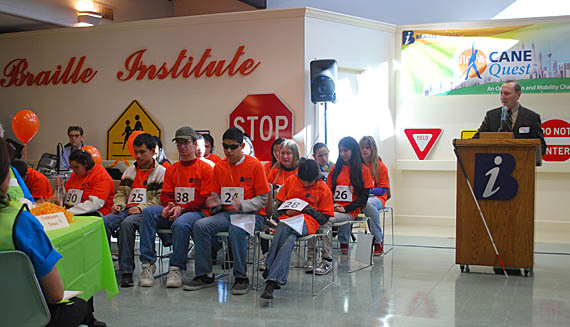 Competitors sat together during the opening ceremonies as Braille Institute officials encouraged them to do their best. 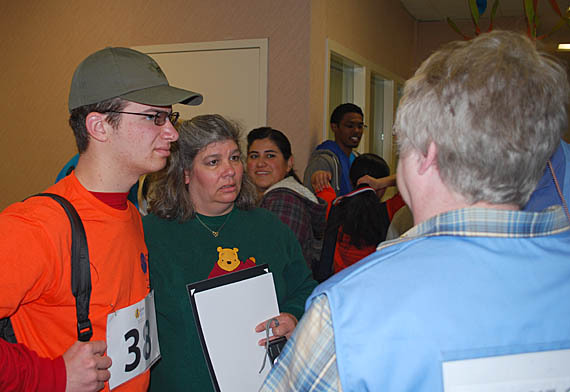 These orange-shirted competitors are in the Trailblazer category for senior-high level students. Entrants in the Explorer category for junior-high level students wore green T-shirts. 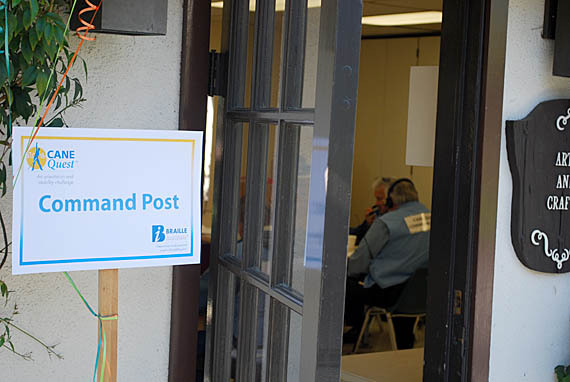 Our Amateur Radio Command Post was in the Crafts Room at Braille Institute. At HDSCS Net Control were Jim McLaughlin AB6UF, Alex Valdez K9BLK and Dave West KI6EPI. Alex, who is totally blind, used his Braille writer to take notes. 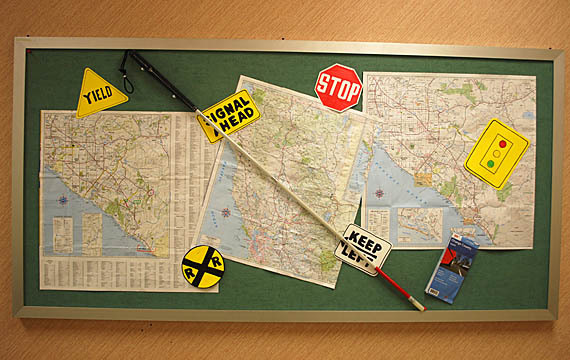 Some routes required competitors to take a bus. Parents and family members of competitors were not allowed to be near the courses. They stayed at Braille Institute where there were informative programs for them. 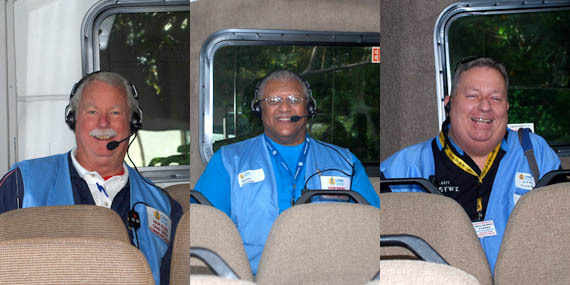 There was a HDSCS communicator on each of the four Braille Institute buses. Left to right are Bill Preston KZ3G, Woody Woodward W6PA and Gary Sanders KC6TWZ. The fourth was Tom Smith KB6A. 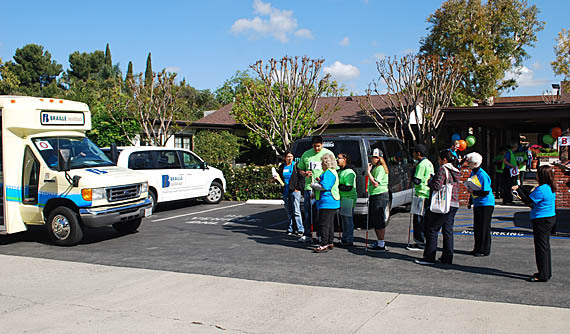 For some routes, the competitors walked to and from Braille Institute with the mobility specialists. 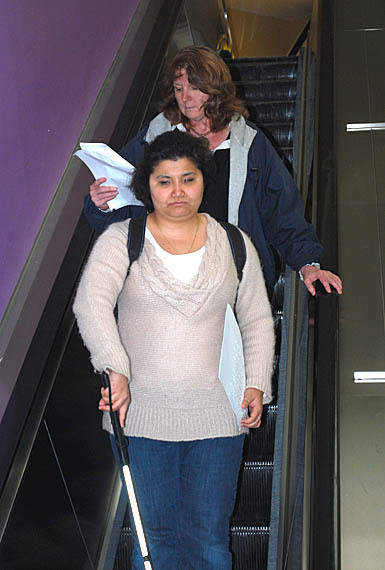 Lea Ann Myers of Braille Institute (at right) is one of the originators and developers of Cane Quest. 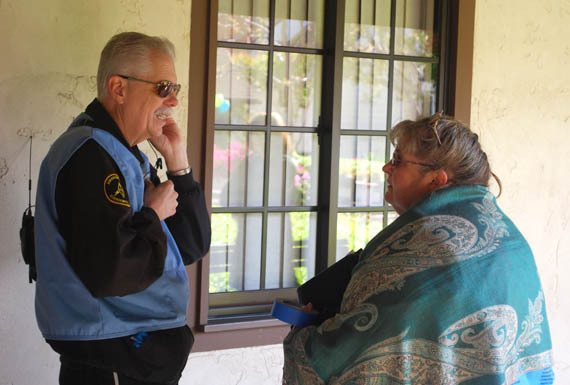 A HDSCS operator "shadowed" her throughout the event to keep her informed and to allow her to quickly answer questions from the field. During the morning, her shadow was Scott Lolmaugh WD8ICK. 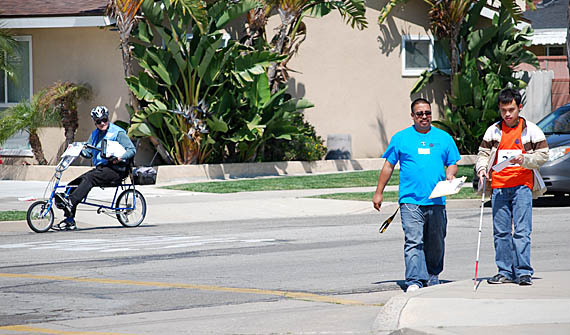 A communicator on a bicycle patrolled each of the four street routes. 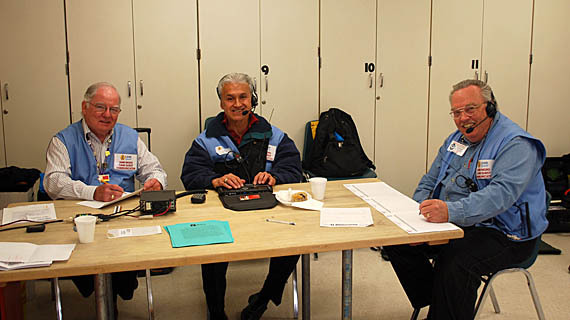 Three of the bicycle communicators are pictured: Fred Wagner KQ6Q, Pete Martinez K2ALM and Tom Gaccione WB2LRH. The fourth was Andrea Martinez K2ALM, pictured below. 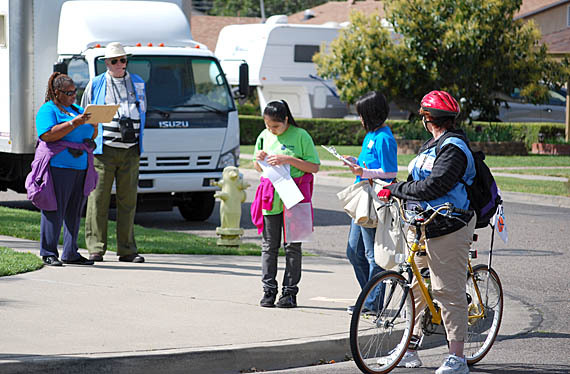 A competitor in the Explorer grouping reads her Braille instructions as she moves along a residential route under the watchful eyes of HDSCS stationary communicator Richard Deen KI6HWY (wearing white hat) and bicycle communicator Andrea Martinez K2ALM. 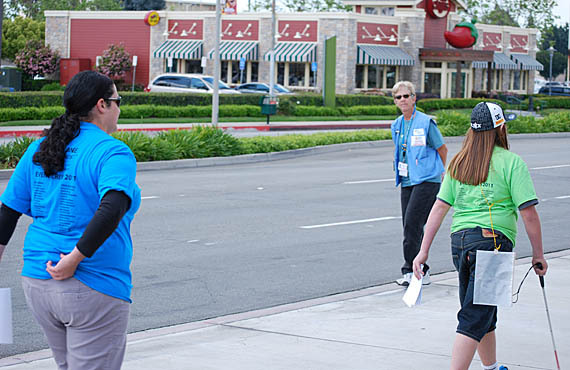 Our communicators wore distinctive blue vests so we would be easily recognizable on the courses. Special vest inserts for the occasion were provided by Braille Institute. Braille Institute mobility specialists on the course wore darker blue T-shirts. 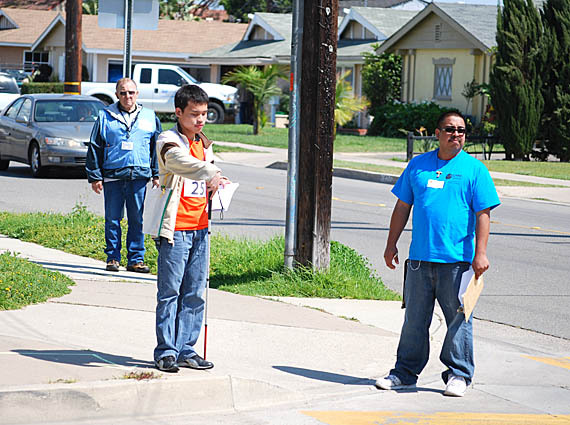 A competitor on the Explorer business route is watched by an Orientation and Mobility specialist and by HDSCS communicator Rebecca Katzen KI6OEM (at the curb). A competitor in the Trailblazer category moves along under the watchful eyes of an Orientation and Mobility specialist and bicycle communicator Fred Wagner KQ6Q. HDSCS communicator Clay Stearns KE6TZR watches in the background as the same competitor nears the end of the Trailblazer residential route. Two of the courses involved navigating around the Buena Park Mall, including using the escalators, finding merchants, and making a purchase. 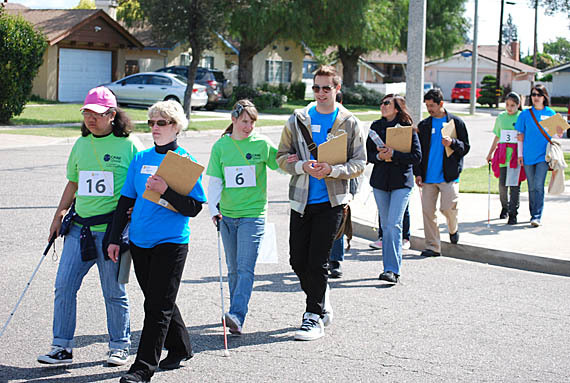 Braille Institute mobility specialists and visually impaired adult volunteers performed a very thorough "test run" of each course several weeks before the event to verify the instructions that would be given to competitors. This photo was taken during that test. Tim Beringer KI6RVS shadowed Lea Ann Myers in the afternoon. 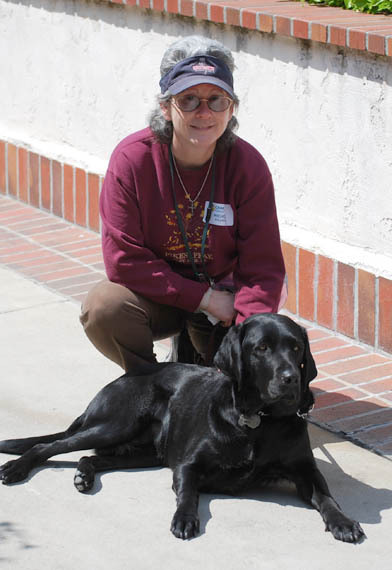 Michele Wagner, the wife of Fred KQ6Q, helped out by taking care of Fabrica, the guide dog of Alex Valdez K9BLK, as Alex performed Net Control duties. A rousing awards ceremony ended the day. One of the winners in the Trailblazer category was Bradley Steinbach, a low-vision student who has had his own ham radio license (KG6VZY) since 2008. These HDSCS communicators gathered for a group photo. Seated at left is April Moell WA6OPS, the HDSCS leader. Standing at rear are Tom Gaccione WB2LRH, Monique Beringer KI6RVT, Bill Preston KZ3G, Ken Simpson W6KOS, Rebecca Katzen KI6OEM, Pete Martinez K2PTM, Dave West KI6EPI, Andrea Martinez K2ALM, Tom Smith KB6A, Fred Wagner KQ6Q, Patricia Beringer KI6RVU, Tim Beringer KI6RVS and Gary Sanders KC6TWZ. In the front row are Jim McLaughlin AB6UF, Alex Valdez K9BLK, Woody Woodward W6PA and Joe Moell KØOV. Participants not pictured are Richard Deen KI6HWY, Scott Lolmaugh WD8ICK and Chris Sanders KE6BRY.